A few weeks ago I moved to a new area (3 miles from my old area, but hey who’s counting) and was after some inspiration for local ‘new things’. I put a message in our town’s Facebook group and the response was amazing! I had over 100 comments from locals with lots of ideas. One of these was Debbie, who edits the town’s magazine. She told me that she was going to a beekeeping taster session in Weybridge and I should come along. 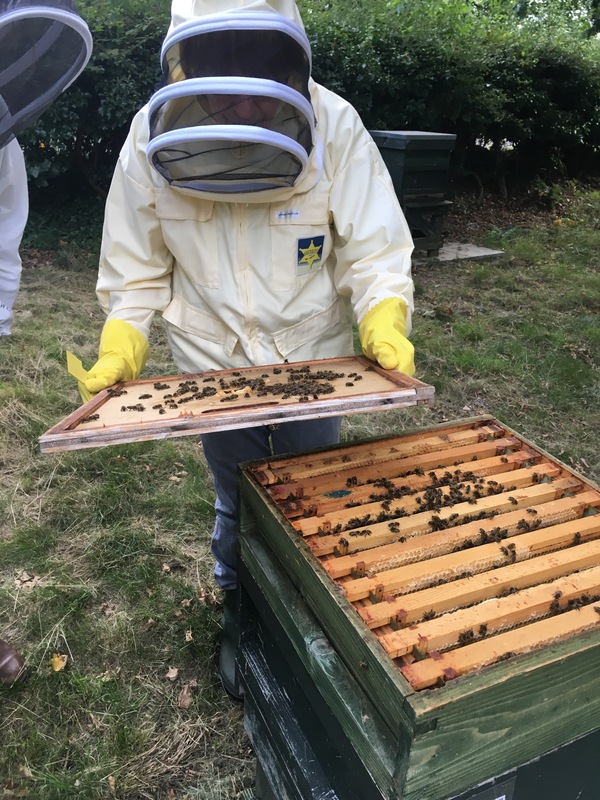 The session was run by The Weybridge Beekeepers Association, who have over 100 members! I was surprised by the number of people who already keep bees, and also the number of people at the session. There was probably about 20 of us new-bees (ha). 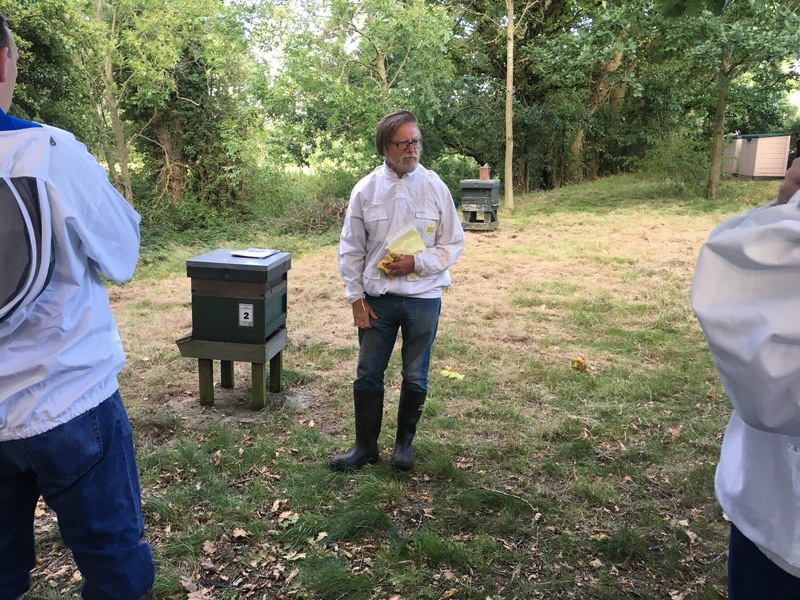 We gathered round in the grassy clearing and Andrew began talking to us about keeping bees. He started the talk by telling us about all the hard work, the outlay in costs, and anything else that might put you off becoming a beekeeper. He said it’s so important to know this before you start, as lots of people just think they can have a nice hive at the end of their garden and not do anything with it.. but it’s a bit more complicated than that. You have to check your bees every week, look out for signs of swarming and diseases. The way they look out for swarming is if the bees are making a new queen – and all that is, is a larger egg cell, so you can imagine it being a lot of work trying to spot that! 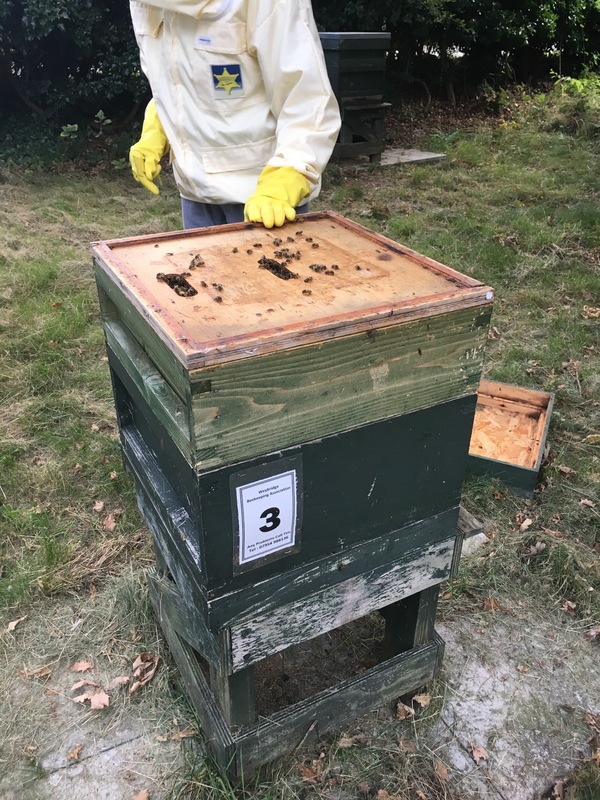 If you do decide to get into beekeeping the outlay would be about £1,000 – for your bees and your hive, and jars etc. 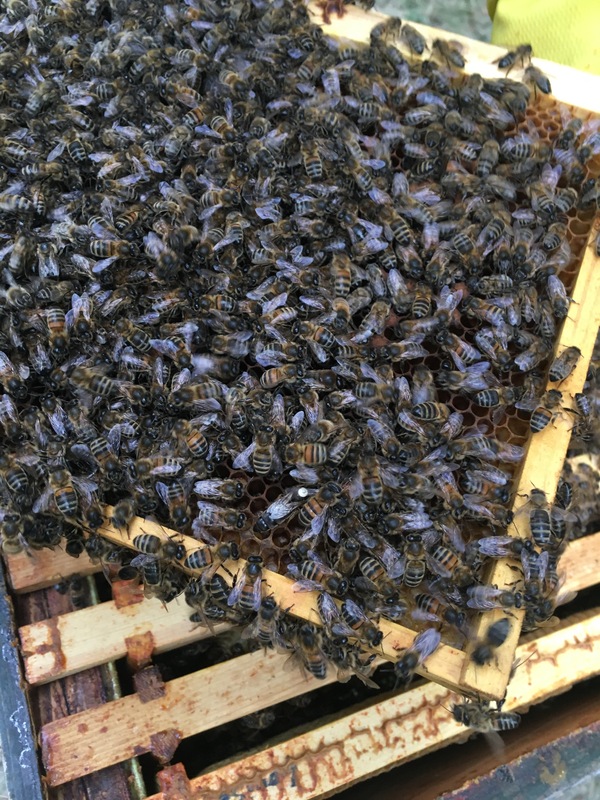 A queen bee can cost up to £40! The good thing is that once you’ve spent this you don’t need to spend much more. And honey is a valuable commodity – it sells for £6-£7 for a pound! After the introduction we geared up to open a hive. 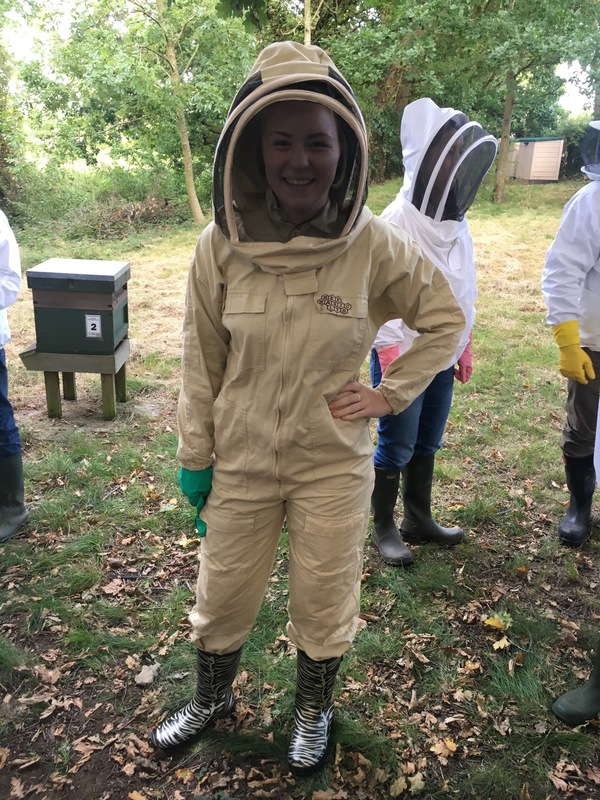 We were given a beesuit, but we had to bring wellies and our own Marigolds! Initially this was all a bit scary. You crack the hive open (the bees seal it themselves!) and the noise starts. You can hear them all buzzing, and there are SO MANY bees. Marion, our lovely beekeeping teacher, is holding one in this picture. We all passed it around to hold. Weirdly, although there are a lot of them and you’re going into their house the bees are very calm. The scared feeling soon dissipated and it was so interesting. 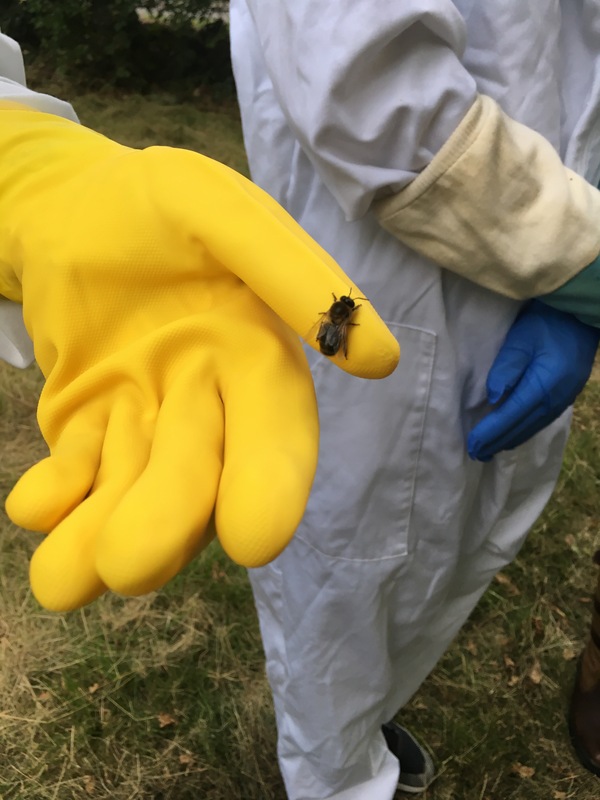 We even held a drone bee, which are the males that breed with the queen. They don’t have stings so it’s not so bad! The bottom layer was a bit crazy. I won’t say anymore, just check these out..
You can see the queen in that one. She’s the one with the white spot on her back, which they paint on to help them spot her. She’s much bigger than the others! The whole thing was absolutely fascinating. I didn’t really realise bees were so interesting. For example, did you know that once a worker bee is born it starts working within a few seconds? They are literally born, stumble around, and then instantly get cracking. I really enjoyed the session and would love to have a hive one day – although perhaps in retirement! 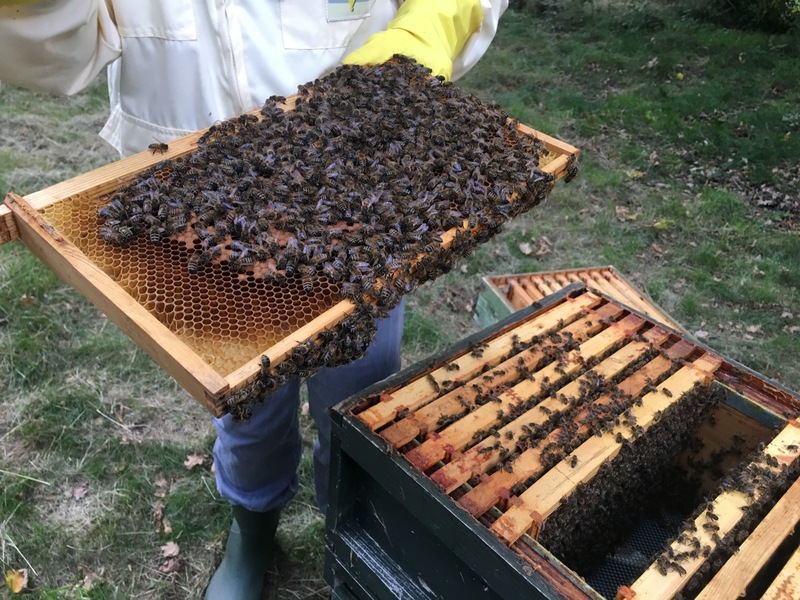 If you’re interested in beekeeping you can find your local association here. I did a taster session hence the timing, but most courses start in January ahead of beekeeping season in March. 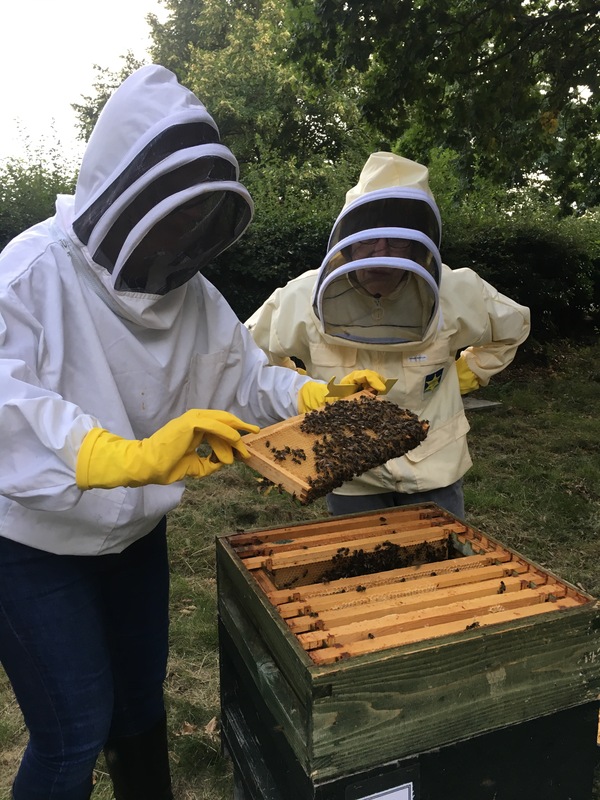 Nice report on the bee taster session.